Forza1 Beach Volleyball Club is newly designed to offer players both indoor and outdoor opportunities to train and compete. Great local conditions and knowledgeable coaches will create the perfect atmosphere to train and grow as a player. 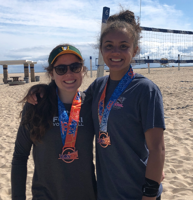 Forza1 Beach Volleyball Club will consistent of players both male and female from ages 9-18 and will range in level and experience. All registration links below details. If you need help registering, call our office. Beach is different than indoor because the individuals are the team. This means they need their own membership and pay their own entry/registration fees. Visit the links below registration to see the different leagues you can play in locally. We recommend CBVA. Beach players are responsible for coaching themselves during games and no outside coaching is allowed during play. Players can talk to coaches during time outs but the process is much different than indoor. Forza1 Training coaches are available for tournaments by reservation only (schedule permitting). 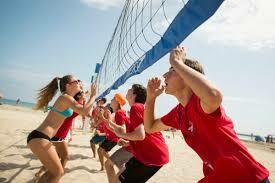 For a beach coach to attend a tournament it is $40/player and it must be paid in advance. These dates are the best options to reserve a Coach for your team. Please note, the coaches may be coaching more than 1 team at any given tournament. What to Wear: Forza1 shirt and spandex/shorts. Forza1 Players can register for and play in any tournament of their choice. For more information on the various local tournament options, search the links below! Why play beach? Beach (in the sand) is the same game but played very differently. The environmental factors and number of players alone challenges players to adapt and adjust their game to find success. On the sand, players get more frequent touches and have to become capable in all their skills to be effective. This makes it both fun and challenging! On the competitive side, players are forced to take more responsibility, be more accountable in their play and ultimately perform under more frequent pressure. This builds the champion in the player, and teaches mental and physical toughness.